It has been a whirlwind over here. We bought our first house and move in 3 weeks. We have been renters for our whole married life (13.5 YEARS!) and are SO excited to be finally moving into OUR OWN HOUSE!!! Between packing/Fall Sport’s/and other busy life happenings, it feels like I haven’t blogged much at all. I MISS YOU GUYS!!!! And don’t worry, I am not going anywhere. I am so thankful for this space and that I am able to do something that I LOVE and contribute to our household financially while doing it! It really is a dream come true. My all time most popular recipe is A Baked Jalapeno Popper Chicken. We’re talking like 2 million views or something crazy like that. It is a recipe my sister gave me and one of our all time favorites as well! Another recipe that is one of my most popular is Slow Cooker Crack Chicken. I am so glad you guys love it as much as we do. This Jalapeno Popper Chicken is in my top 3 most viewed recipes just about every single day!! You guys love it and so do we! This Slow Cooker Crack Chicken is my most popular crock pot recipe!!!! SO GOOD! Since we have been so busy, I have been using my slow cooker or instant pot almost every day. I decided to try and merge my Jalapeno Popper Chicken and my Slow Cooker Crack Chicken and let’s just say, it was a GREAT idea. We absolutely LOVED it. And SO, so easy!!!! Perfect for a busy weeknight meal!!! We ate it on hamburger buns and have already made it again LOL! The leftovers were SO GOOD for lunches too! MAKE IT!!! K??? Hungry for more? Click here for the 50 MOST Popular Slow Cooker Recipes!!!! Sprinkle chicken with salt, pepper and garlic powder, generously. Place in crock pot. I like to use a slow cooker liner for this recipe and anything else creamy for easy clean up. Add onion, jalapeno peppers and cream cheese. Cook on low for 6 hours. Shred chicken with 2 forks in the crock pot. Add mayo and cooked bacon pieces and stir to combine. Combine cheddar, Parmesan and Ritz cracker crumbs. Sprinkle of chicken. Pour melted butter over the top and replace lid. Cook for 10 minutes or until cheese is melted. Serve on hamburger buns with extra peppers for those that like it spicy and ENJOY!!!! You combined two of your best recipes in one spot!! Brilliant! 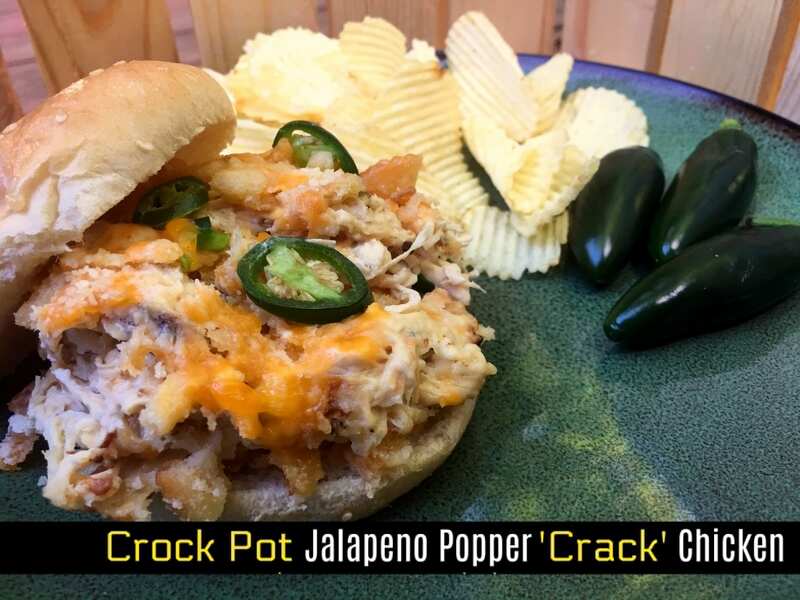 Love the jalapeno part here, it looks really delicious. Can’t wait to try it! I’m drooling just thinking of the flavors here! I can’t wait to try it! I love this recipe! It’s so simple and easy and just delicious!! !